If you were in that situation, how would you want others to respond to you? The first person to speak up admitted she wasn't sure she could imagine being like Denver - homeless, living on the streets with no education. She wasn't sure anyone who'd grown up as we'd grown up could put themselves in that mindset and truly imagine what it would be like, how we'd want others to respond to us. There was a lot of agreeing. I'm rarely the first person to speak up in groups. Partly because it takes me a while to gather my thoughts into words - I think in images, little mini-movies and as I grow older, the translation from that into words others will understand is getting more and more difficult. This morning, I was more off-balance than usual because I'd already tried to make a minor point earlier ... and wound up pretty inarticulate and felt that I'd lost respect from some folks I admired. So I was really struggling to piece my thoughts together coherently ... and by the time I was ready to speak, the group had moved on from that portion of the discussion to something else. Personally, I think while there's truth to saying it's difficult to put ourselves in the mindset of someone who has never had even an opportunity to be educated and is homeless, I think it's a cop-out to claim that we can't do it or at least get close. I grew up in the 'burbs one town to the east of Fort Worth and at 17, I began making serious plans for running away from home. A part of that planning was to imagine what my life would be like on the street. What would my chances be of getting into a runaway shelter the first night I was out on my own? Would they insist that I return to my parents? I was contemplating entering a life not just uncertain but completely comprised of chance and uncertainty. I wanted others to see me as invisible. Now there's a statement of contradictions and uncertainties. I had quite early on become a master of disguises, showing everyone what they wanted to see - at least to a certain extent. I was by no means the perfect chameleon because I didn't want to be. I always had a very strong sense of self ... but from very early on I also came to understand that it was not socially acceptable to be me. I was too blunt, too matter-of-fact, too practical and too out-of-sync with other children of my age and background. So I learned how to let aspects of my self shine through, but not so much that it overwhelmed people. Elementary school was particularly difficult, trying to learn this balance and still feel true to my self. But it wasn't just my personality or who I was. It was also what I had - and was continuing to - experience which set me apart from most of my peers. On the surface, it wasn't that different. A lot of kids in Texas had an alcoholic father and an overly religious mother - this was the heart of the Bible belt, after all. But the depths to which the abuses of religion, of body, of mind and spirit went ... tended to set me apart. I learned how to hide all of that so completely, it was often difficult for me to even remember what I had experienced, much less tell someone else about it. That aspect of my life was invisible, and I liked it that way. Invisible meant no uncomfortable questions about how I knew certain things. No uncomfortable questions about why I was so rarely allowed over to friends' houses and why they were so rarely allowed at mine. No uncomfortable questions about why I didn't "get" the finer aspects of interacting with kids my age. No uncomfortable questions about why I just wanted to be left alone with my Fisher Price to play in my own little world. So my first reaction while reading this book, was of course Denver wanted to be invisible. When you are noticed, then questions get asked. Well-intentioned questions, but questions that dig up those things which you would like to stay invisible even to your self. It becomes a slippery slope where the better you are at what you're doing ... the more lost you become. The more you have to layer some kind of disguise around you to hide that core of goodness and hope and that spirit of being a survivor and a fighter - because when those things shine through, then you get noticed. And in any kind of combative situation (like the street or prison or the house I grew up in), if you're noticed, you're a target. Now maybe that is difficult for a lot of people to imagine. I wouldn't know ... it's how I lived for a long, long time. It's still difficult for me to be noticed - I'd far rather be in the background. So when I first read the discussion question, that was my answer - I would want to remain invisible. But that's the real paradox of the situation. Because that answer isn't exactly true. Of course everyone who still has some hope of making a "better" or "good" life, wants to be noticed. I think unless you've managed to completely and totally give up on life, there is that seed within us which cries out to be noticed that we are still good people who have something of value to contribute. Some of us wear that seed on our sleeve and give it constant care and attention. Some of us learned to create a tiny greenhouse, deep inside ourselves to protect and nurture that seed until it was strong enough and safe enough to not be destroyed by outside forces. Were I uneducated, not able to read, write or do simple maths ... how would I want people to respond to me? The same way I wish people would respond to me today. Not fear me because I'm different. Not fear me or get angry or frustrated with me because I can't communicate as clearly or quickly as I'd like. Not get angry when I point out that other ways of thinking and being can be just as legitimate as the way they think or are. Not fear me when I tell my story. Not feel the need to rush in with words where silence is perfectly comfortable. Not feel a need to "fix" what doesn't need fixing. I would want them to take the time to get to know me. To know me where I am now and not force me to come to them on their terms. If I'd been living on the streets for years and not really known any other life, I would not want to suddenly be inundated with the trappings of modern, convenient life. It takes time to grow accustomed to a new way of living. If I, being who I am today, were suddenly homeless, how would I want others to respond to me? If I were under a bridge, sleeping in a box, I would want to be completely invisible. To make no eye contact with others in my shame. During the day, when the situation was new, I would want that invisibility to cloak me as I tried to find a way to clean up, make myself presentable and fling off the invisibility as I tried to find employment, cash and a roof over my head while wrapping that cloak of invisibility over the fact that I was homeless and whatever the circumstances were that had caused that to happen. Eventually, if circumstances didn't change ... that need to be invisible would quite likely envelope me completely. Maybe because I spent so much time in various states of invisibility as a child and a teenager I don't find this difficult to imagine at all. 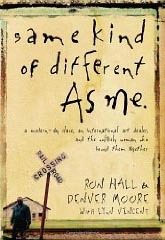 Maybe I'm the same kind of different as Denver and Ron - the authors of the book. But I think that was their point - we're all the same kind of different. Far more alike than we can imagine on the surface of it. I think it far more likely that many of us have thrown that cloak of invisibility around this area of "what would it be like to be homeless" because we don't want to look at it. It's too uncomfortable and frightening to contemplate. And that's where I am different from many people. It is uncomfortable and it is frightening. But I would rather think of it now and begin planning on how to take action ... than to be surprised by it later and forced to only react in short-term ways which aren't necessarily the best. And that's a kind of different I'm happy to live with. That's one of my favorite books ever. It's amazing. The line that really struck me was that the people at the church near where the homeless man always hung out NEVER offered him help. I have seen plenty of kids at work, who would like to be invisible in one way or another and it is my job to help them feel less like hiding and more like they are accepted for who they are so they can discover their potential. Not an easy task at a middle school. And I never though of these kids in quite the way you presented them. Thank you.